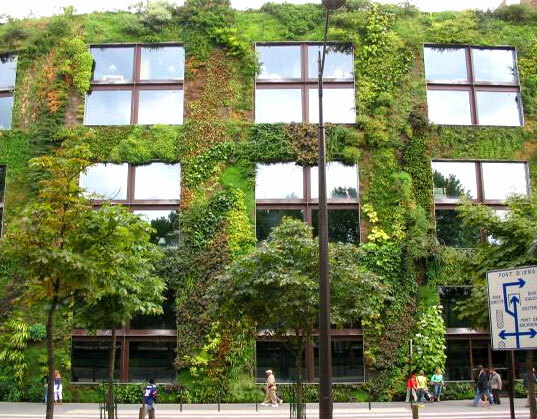 The Living Wall, Quai Branly Museum ? The Musée du quai Branly (the Quai Branly Museum) features indigenous art, cultures and civilizations from Africa, Asia, Oceania, and the Americas. French President Jacques Chirac was a very influential proponent of the project. The building was designed by architect Jean Nouvel. A building four stores tall whose walls are entirely cloaked in living vegetation from roof to sidewalk, the “living wall” designed and planted by Gilles Clément and Patrick Blanc. The museum is located at 37, quai Branly – portail Debilly, 75007 Paris, close to the Eiffel Tower.